Engineer, born in Phantassie, East Lothian. Rennie was educated at Prestonkirk and in Dunbar, before starting in Andrew Meikle's engineering works at Houston Mill at the age of 12. He was then able to attend the University of Edinburgh (1780-3) and continue his career in agricultural land improvement. 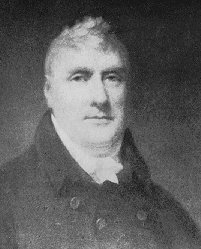 However, Rennie travelled to England in 1784 and began a career in engineering. He was recommended to James Watt (1736 - 1819) and took charge of the Albion Flour Mill (Blackfriars, London) installing new steam-powered machinery. He went on to build docks from Wick to Torquay, including the London and East India docks and canals, including the Crinan Canal and Kennet & Avon Canal. Also in London he was responsible for the Southwark, Waterloo and London Bridges (the latter is now re-erected in Arizona). In Scotland, he built bridges at Kelso, Musselburgh, New Galloway and Newton Stewart. He is buried in St. Paul's Cathedral in London, and was succeeded in his engineering business by his sons George (1791 - 1866) and John (1794 - 1874).